If you’re thinking about buying “a puppy” just because you think it might be good for the kids to learn responsibility or that photo just looked so damn cute or you want “something” to keep an eye on the house or you want to impress your friends, then don’t buy a dog – all breeds of dog need to be in a loving, caring home where their people treat them as part of the family, look after them well, are prepared to spend the money on vet bills and provide everything they could possibly need for the term of their lives. Dog ownership is a misleading term – you must be prepared to be owned by your dog. 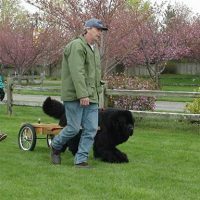 If you still want to research Newfoundlands, call or email all the owners and breeders you can find, tell them your story and ask them to tell you some about this glorious breed, read all the material you can get your hands on and make an informed decision about inviting a Newf to join your family. Any reputable breeder will have done all relevant health checks on breeding stock at the very least. 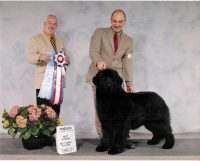 Ask all breeders what they screen for and copies of any certificates/reports pertaining to your prospective puppy. Most breeders will also require you to answer a lot of questions and give them guarantees of your intentions toward a puppy. Hip & Elbow Dysplasia – All breeding stock should have been X-rayed prior to breeding – each animal (Sire & Dam) will have a score sheet from the AVA (Australian Veterinary Assoication) which the breeder should be happy to show you. Cystinuria – This disease is detected using a DNA test. Provided the status of both parents is known, selective breeding can be undertaken.